“We’re going to make a Mickey Mouse cake for baby Piglet’s birthday,” my daughter announced. Her words immediately triggered alarm bells in my head. I looked away from my computer aware this conversation needed my full attention. “We” probably meant “You” as in “Me”. “Really?” my response was at best non-committal and even a little lukewarm. 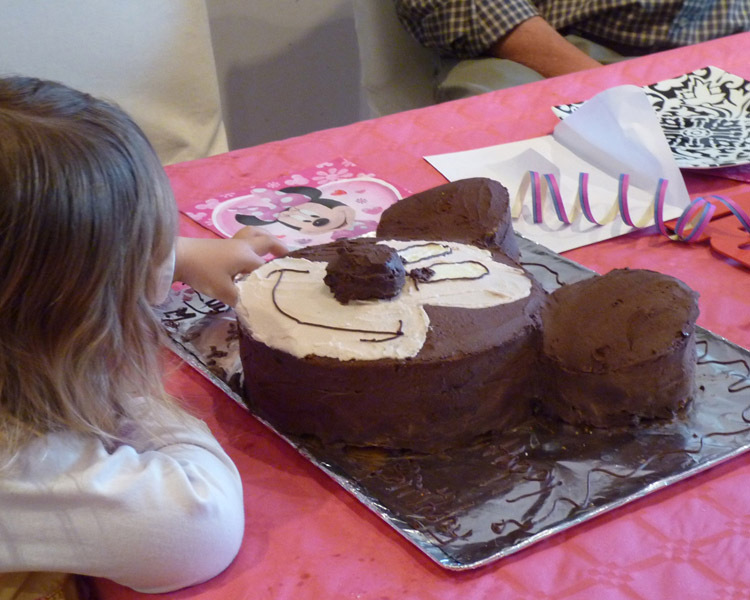 I knew my granddaughter loved Mickey Mouse, but a cake? Great, I thought, she’s already self-managing her expectations which is encouraging. In the past I’ve found the French relatives ‘picky’ about food and rather superior when it came to fancy cakes, pastries and chocolates. “Do you have the recipe?” I asked, trying to sound enthusiastic. I groaned inwardly as I paused to consider the success of our last caked decorating venture. My only life-experience of making a themed cake, and then only as an observer, was over 20 years ago when my children, then aged seven and nine, entered their school Christmas cake decorating competition. Naturally, as the event was for the ‘children’ I encouraged them to make and decorate their own cake, as one would. However, as they carefully applied the icing, crumbs of cake stuck to the knife resulting in a rather uneven surface – almost like the craters on the moon. The result looked like the cake had been dropped on the floor and then stuck back together. However, as their little faces looked up at me waiting for praise, what else could I say other than. The next day they proudly displayed their cake now titled “The Abominibal Snowman” on the judging table. As we all stared at the other entries I realised to my horror I’d let them down. Entries came in all shapes and sizes and all beautifully decorated to an extremely high standard. There were Christmas Trees, Nativity scenes, Reindeer and my favourite which was a cake in the shape of a roof with Santa peeping out of the chimney. Now call me cynical, but the jaw-dropping standard of entries were not cakes cooked and created by children. My children looked at me for reassurance as the other contestants sniggered at their entry. I felt miffed. “At least you can say you made AND decorated your cake,” I said as we walked away. I’m still reminiscing when I refocus on the conversation to discover not only did I have to bake the cake with a recipe I had yet to find (courtesy of Mr. Google), but to design it as well and shop for the ingredients. The scariest part however, was the fact that the thermostat on my daughter’s pigging oven was erratic and unreliable and would burn the cake to a crisp in a blink of an eye. The next morning our shopping foray to L Clerk hypermarket to buy ingredients for the cake proved easier than expected. The only hiccup being you could not buy self-raising flour in France. Even as I write this, I’m still not convinced; France, the gastronomic centre of the Universe, does not sell self-raising flour. No way! I also discovered you could not buy rolls of pre-prepared icing, which you just rolled out and cut to shape. We decided to improvise and made butter icing which we dyed with Cocoa powder (brown) for the head, and pink for the face. Sorted! Ingredients procured our next projects were to design a Mickey Mouse template for the icing and then bake the cake without cremating it. Success! So far, so good. I made the icing and then deftly passed the responsibility of creating the shape of Mickey’s head and decorating the cake to my daughter while I poured myself a large glass of red wine. Up to this point it had taken us over three hours and I felt emotionally and physically exhausted. Our granddaughter’s birthday was the next day and guests were due to arrive at eleven; there was no time-margin for error. I looked on in horror as history was about to repeat itself, but this time I was a little wiser. “It gives a more even layer and you won’t end up with half the cake in the icing,” I said, as I demonstrated the process to my daughter and son-in-law who had now joined us in the kitchen. Two hours later although the cake was finally finished we were also rather tipsy. I’m not sure what my Granddaughter thought of the cake, but the French relatives were impressed and even asked for a second helping! Tales from France – Tete de Veau – bone out! Nice to see that, in the kitchen, the British can still teach the French how to it’s done. Congratulations, PiP! It looks great. I remember making some themed cakes when my son was little. I even took a cake decorating course a hundred years ago. I turned out some fairly home-spun-looking decorated cakes, but I agree with daughter Piglet. Homemade is better than store-bought, even if it looks less than perfect. Hi Sally, I’ve seen loads of cakes recently and they all seem to use a special icing. Lucky we stayed sober! Well, the rule is a glass into the recipe and one poured for the cook, isn’t it? Since [I presume] the cake did not contain any of the said wine, of course the cook[s] got two and look at the fab result 🙂 ! And I guess there was laughter in the house afterwards! I love it. What a sweet memory of your children’s cake and now the antics of making your granddaughter’s birthday. By-the-way, I think your children’s cake should have won just based on the fact they made it themselves for the contest. Happy birthday to baby Piglet. Congratulations on a lovely cake. I too baked and iced a Mickey Mouse cake (just like yours) for one of my daughter’s birthdays…can’t remember which one! Looks great. I’ wished I’d have known. I needed some tips! Wonderful! It is just beautiful! Great story, great cake! My heartiest congrats to Chef PiP! It sure does look tasty! I’ll take an ear and a noggin of nose please! What a nice outcome. If I would have tried that Mickey would have turned out looking like a rat.